HOLDEN MONARO COUPE. Displays well. Great collectable. In original box. Never been removed from box. (small marks on box). NICE MR GOODWRENCH 18 WHEELER IN ORIGINAL BOX. MINOR DIRT MARK ON REAR OF TRUCK ABOVE THE REAR TIRES. Nylint Mr. Goodwrench Tractor Trailer 18 Wheeler It's Not Just A Car NIB. This is a two piece toy.the cab pins to the hauler part. The color is green. This toy has all wheels and intact windshield and side windows and steering wheel. There are two red Tonka stickers on the cab doors. Tootsietoy Cars & Trucks. 2 cannot find a number. 1 is marked 4. 1/18 Scale Diecast Model by Greenlight. Scale 1/18. Ending Soon. New Arrivals. The RM Toys Team. Kind Regards. Our aim is to ensure no matter what the model, we will provide an excellent service experience. The MODEL is in EXCELLENT condition - Previously displayed. The BOX is in EXCELLENT condition. 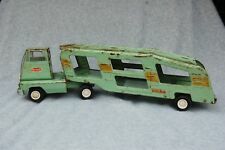 1/18 Scale Diecast Model by Ertl. Material Diecast. Scale 1/18. Ending Soon. Product Details. MINT - The item is in perfect condition. SPARES or REPAIR - The item will be in a poor condition. Our aim is to ensure no matter what the model, we will provide an excellent service experience. 2 CAR HOT WHEELS LOT GAS MONKEY GARAGE. BLUE 68 CORVETTE NIGHTBURNERZ 9/10. Scale 1/18. EXCELLENT - The item will have had very careful use, with only small imperfections. Ending Soon. New Arrivals. The RM Toys Team. Kind Regards. Our aim is to ensure no matter what the model, we will provide an excellent service experience. 1/18 Scale Model by BURAGO. Scale 1/18. The Model Is In NEAR MINT Condition - Previously displayed. The Box Is In GOOD Condition - Worn. Our aim is to ensure no matter what the model, we will provide an excellent service experience. 1/18 Scale Model by GT SPIRIT. Scale 1/18. Model is in MINT condition. Box is in MINT condition. MINT - The item is in perfect condition. The RM Toys Team. Kind Regards. Add to Favourites. 1/18 Scale Model by BAUER. Scale 1/18. Ending Soon. New Arrivals. The RM Toys Team. Kind Regards. Our aim is to ensure no matter what the model, we will provide an excellent service experience. GRADING CONDITIONS. 1/18 Scale Model by BURAGO. Scale 1/18. EXCELLENT - The item will have had very careful use, with only small imperfections. The RM Toys Team. Kind Regards. Our aim is to ensure no matter what the model, we will provide an excellent service experience. 1/18 Scale Model by MAISTO. Ending Soon. New Arrivals. GOOD - The item will have had more use, showing obvious imperfections. The RM Toys Team. Kind Regards. Our aim is to ensure no matter what the model, we will provide an excellent service experience. Trending at C $8.09eBay determines this price through a machine-learned model of the product's sale prices within the last 90 days. Used toy - its paint is heavily playworn. This vehicle is not boxed. Hot Wheels Cars collecting case of tin for 18 cars. Collecting case of tin for 18 cars. Practical carrying handle and simple closure for optimal transport. 1x Cars collecting case. Compatible with the cars of Hot Wheels. Trending at C $31.30eBay determines this price through a machine-learned model of the product's sale prices within the last 90 days. Collecting case of tin for 18 cars. Practical carrying handle and simple closure for optimal transport. Compatible with the cars of Hot Wheels. The MODEL is in MINT condition. The BOX is in NEAR MINT condition - V.slight wear / dusty. Item model number: 2883. Hot Wheels Cars collecting case of tin for 18 cars Box Contains 1x Cars collecting case. Collecting case of tin for 18 cars. Material Type(s): Tin. Compatible with the cars of Hot Wheels. Item model number: 2883. Hot Wheels Cars collecting case of tin for 18 cars Box Contains 1x Cars collecting case. Collecting case of tin for 18 cars. Compatible with the cars of Hot Wheels. Scale: 1:6.